The launch of a book to honour the research and writings of Prof John Coakley. Dynamics of Political Change in Ireland: Making and Breaking a Divided Island, edited by Niall Ó Dochartaigh (NUI Galway) Katy Hayward (QUB) and Elizabeth Meehan (UCD), published by Routledge, January 2017. 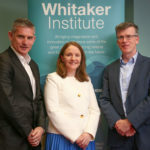 Dynamics of Political Change in Ireland is focused on core themes in the distinguished research career of Prof John Coakley. It examines the interrelated dynamics of political action, ideology and state structures in Northern Ireland and the Republic of Ireland, emphasising the wider UK and European contexts in which they are nested. Originating in a conference held to mark his retirement from UCD, this volume includes chapters by friends, former colleagues and students of John. It makes a contribution to wider European and international debates over state and nation and contested borders, looking at the dialectic between political action and institutions, examining party politics, ideological struggle and institutional change. It goes beyond the binary approaches to Irish politics and looks at the deep shifts associated with major socio-political changes, such as immigration, gender equality and civil society activism. Interdisciplinary in approach, it includes contributions from across history, law, sociology and political science and draws on a rich body of knowledge and original research data. Copies of the book will be available for purchase at a specially reduced price.